Here, the Entity Types and collections, and their relations, of the OData service are defined. Data groups from Intrexx applications are also selected. Each data group represents an Entity Type and is automatically available in the service as an OData entity collection. Relations between Entity Types are represented in OData using what are called Association Sets and Navigation Properties. You can select parent-child relationships and references between Intrexx data groups, in order to define them as Navigation Properties in the corresponding Entity Types. Opens a dialog where the application and data group can be selected. 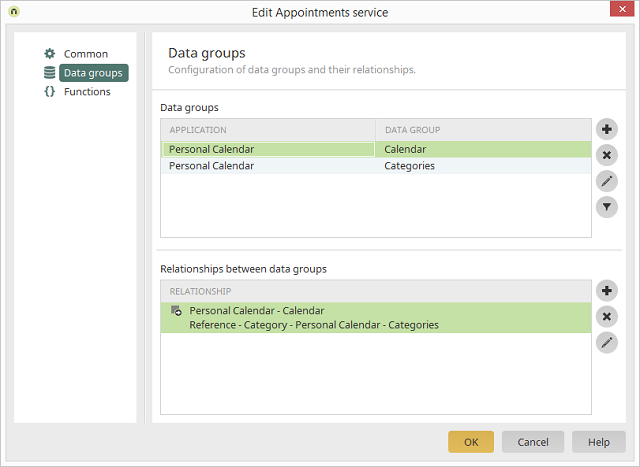 A data group may only be added to each service once. Removes the currently selected data group. Opens a dialog where the properties of the data group can be edited. Opens a dialog where a filter for the currently selected data group can be created. This global filter will then be used on this data group for each OData request, regardless of whether a filter has been defined in the OData request. However, in the latter case, the global filter will be combined with the request filter. This allows you to ensure that at a fundamental level, only certain data records can be accessed via an OData service.